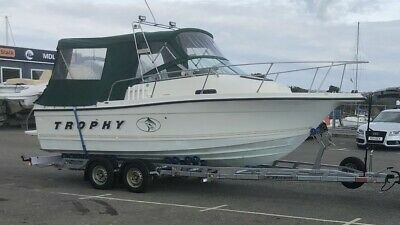 2001 Bayliner Trophy with Mercruiser 4.3 Ltr Petrol inboard with Outdrive Leg. Boat in good condition for age and is currently being cleaned and refurbished with electronics and new lights being fitted. PLEASE NOTE THE TRAILER IS NOT INCLUDED IN THE SALE PRICE. This is brand new and is available by separate negotiation. Ideal fishing platform. Canopy is tired and in need of repair but is ‘serviceable’ in its current state. Boat has new VHF set up, new Fire Extinguisher, New rear handrails with integrated rod rests, new Nav Lights, new Cockpit and cabin lights (all LED). Boat is equipped with Navman Fishfinder and iPad with Avionics App. The boat is about to be professionally cleaned and polished and the decals will all be new. Please note the pictures were taken last summer, the Auxiliary outboard is NOT included nor is the Trailer. TRAILER IS AVAILABLE BY SEPARATE NEGOTIATION, ITS BRNAD NEW. I can provide recent photos if needed. Boat can be viewed by prior arrangement.